Desert Palm Hotel & Resort, a luxurious retreat just 20 minutes from Dubai’s urban heart, has opened a new spa experience with the launch of Samāna Spa. A sanctuary of wellness and serenity only a short journey away from the city, Samāna Spa provides the perfect escape to unwind and recuperate. Born from Sanskrit, Samāna means calming or soothing. We want you to be able to escape from the pollutants of the world to a place that will leave you feeling revitalised and renewed through carefully selected products and curated treatments. Begin a journey of restoration with our Experience Guides and Gurus who will help explore the apothecary styled homoeopathic Aromatherapy Bar available only at Samāna Spa. Since 1974, Tisserand UK has been carefully harvesting wild ingredients to produce pure organic essential oils. From a range of over 40 essential oils, we have carefully selected 20 essential oils with blends to aid you to relax, restore, rejuvenate and ready to tackle the world. Guests can not only immerse in the latest spa therapies designed to stimulate the senses and indulge in the ancient practice of combining aromatherapy and massage for the perfect treatment, but can also choose from unique aromatherapy blends or their own bespoke combination of essential oils to suit individual needs. With a selection of nourishing oils that absorb into the skin and penetrate deeply into the body tissue, guests will feel the positive effect on the mind, body and spirit to enhance emotional well-being. Samāna Spa houses Eminence Organics facial skin care treatments which are designed to promote the philosophy of over 50 years of Hungarian skin care wisdom. Its humble roots from a traditional village have grown into an emerging favourite amongst industry professionals and spa-goers. Eminence’s organic face and body elixirs heal and beautify with nature’s pure riches for the ultimate in ensuring clean beauty. Alongside Eminence, Samāna offers Voya, which creates its products from hand-harvested organic seaweed and natural seawater from the wild Atlantic coast off the shores of Ireland. Voya’s products come from nature’s most potent antioxidant which is incredibly rich in minerals, vitamins and a bioactive compound that nourishes, moisturises and revitalises the skin. The Signature packages range from the half day “Samāna Experience” and the full day “Samāna Retreat”, a part of the Samāna Journey which includes a deep tissue or Swedish massage and a body polish or an express cleansing facial along with complimentary pool access and lunch in Epicure restaurant to Body brightening and Latvia Moor Mud Body Wrap treatments which helps to detoxify the body, improve circulation and alleviate muscle pain. 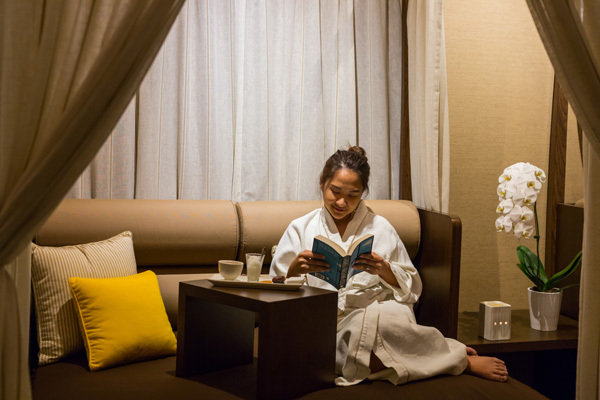 Each treatment on the menu is specifically designed to combine recuperation and renewal from urban hustle. Marina Kutskaya, Samāna Spa’s manager, believes that clean beauty and wellness are paramount to today’s hectic lifestyle. “We are delighted to provide a platform for your individual self-renewal and restoration. Time is a luxury in everyone’s life today and it’s important to spend your time taking care of yourself in an environment that is free of toxins from your mind and body”. Beautifully tucked away in the main house of the polo estate, all six treatment rooms overlook the lush green landscape of the polo fields including a couples’ room where guests can share moments in a calm and serene environment.